This past July Bob Denham was in Moncton, New Brunswick, to assist the Frye Festival in its celebration of Frye’s 100th birthday. Bob’s great contribution was his donation to the Moncton Public Library of his collection of Northrop Frye books and related materials, as well as many pieces of artwork. The Moncton celebration was briefly noted in a previous post (July 23), and the talk that Bob gave on that occasion was posted in full on July 16. At this time I am pleased to report that almost all of the approximately 450 books have been catalogued and are easily available in the Heritage Room at the library for viewing and studying (though not for withdrawal). 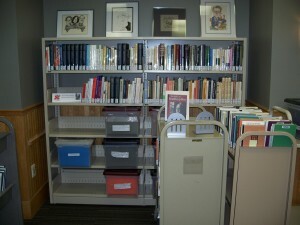 The other materials (listed below) are also available, neatly filed and housed in plastic bins. The artwork, including many portraits and caricatures of Frye, are placed about the room, though not yet in their final arrangement. Frye’s writing desk from his Clifton Road home is here. A bronze bust of Frye by Hanna Boos, a smaller version of the one in Northrop Frye Hall at Victoria College, is here. The approximately 450 books include all of Frye’s books, 18 of the 30 volumes of the Collected Works, many translations, about 40 books edited by Frye, about 30 volumes written by others and devoted to Frye, about 70 volumes containing essays by Frye, and 75 volumes which in some way, shape or form give reference to Frye. Beyond the books is a treasure trove of primary and secondary materials that can be found nowhere else. The approximately 450 books, plus all the related materials, could be a boon to anyone doing research on Frye or anyone interested in Frye. Come to Moncton, visit the Public Library, and ask to see the Bob Denham Collection, housed in the Heritage Room. You can spend all day here if you want, or several days. It’s as easy as that. This entry was posted in Uncategorized on October 31, 2012 by Ed Lemond.